All throughout my teenage years and 20's I had wavy hair with little frizzies framing my face. I spent countless hours either straigtening my hair or curling it... mostly scrunching and adding some pretty curls around my face. The last few years since I had weightloss surgery, I've noticed a huge change in the texture of my hair, as well as the thickness... no more curls or little frizzies. My hair seems to be as straight as can be, even the frizzies have disappeared. Every once in a while I miss my curls, and get the urge to break out the curling iron. Since my hair is straight as can be, it takes me triple the amount of time to get the look that I used to acheive in the past. 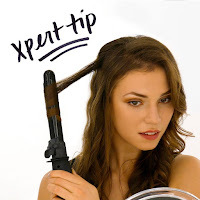 I was fortunate to get to test out the Satin Waves Auto Styler by Xtava, which takes a huge part of the work out of it. You're probably wondering how does this curling iron do the work for me? Well, it features an automated bi-directional rotating control, and a built-in hair clip, which means that you can easily style your hair with the touch of a button! Just secure some hair into the clip, and the iron does the rest for you. The main barrel of the iron is made of ceramic tourmaline, which helps generate constant and even heat. The iron can be used on all hair types, which features up to 11 temperature settings with a range from 210-430 degrees. It also has a swivel cord that rotates 360 degrees, which helps prevent the cord from getting twisted, and prevents your hair from getting tangled. Forget to turn the curling iron off? Don't worry... it has an auto off function just in case! When I opened the perfectly packaged parcel when it arrived via the postman, I found a nicely decorated product box. The company paid special attention to the quality of the packaging for this product, and before even opening the box I could tell that this was excellent quality. When I peeled the safety sticker off the box, it stated that it has been opened! Yes, once it's opened you'd know if you received a new product or if it was a returned one! Knowing that right away, I know that no one has tried using this prior to myself. Once the box was opened, the iron was nicely secured in the box. You could easily keep it stored in the box for easy storage under the sink, or if you're like me I have a hook on the inside of the door under the sink. The iron is lightweight but at the same time it's completely solid. I own a few irons, and this one is by far better quality than the others. Not only does it have more features, but my hair gets caught less than the others. My hair is currently thinning due to health reasons, so it's important to me that my styling products don't further damage my hair. Honestly, I've tossed the others in the donation bin near my home, and I'm 100% saticfied with my new addition to my beauty products. Interested in getting some of their products? Sure you are... click here to grab yours today. Interested in checking out their Facebook page? Of course you do... you never know when you may come across a deal!